A colleague and I recently attended a local AAF awards show and to our surprise we earned 4 Gold and 4 Silver ADDY’s for Websites, Internet Marketing and an Integrated Campaign. 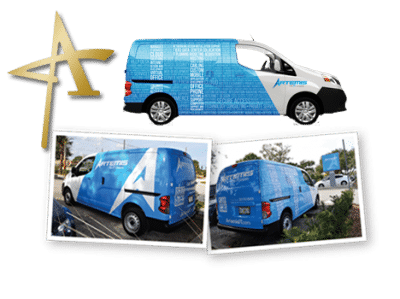 I was especially proud of the Artemis van wrap and I can’t wait to see more of these vehicles on the road. With the term I.T. meaning different things to different people, it was difficult to quickly state what Artemis IT does in a manner that doesn’t immediately bore the room. The word “IT” on the side of the van is really a giant puzzle of words and phrases related to the IT industry. The idea behind my concept is, “IT is comprised of all of these things”. To be a successful IT company, the skill-sets required are vast a varied. Rather than focus on the individual skills or technologies we attempt to convey that IT is the sum of all its parts and more importantly – so is Artemis. In addition, we took home Best of Category: Digital which reinforces our belief that all sites need to be designed with mobile in mind. 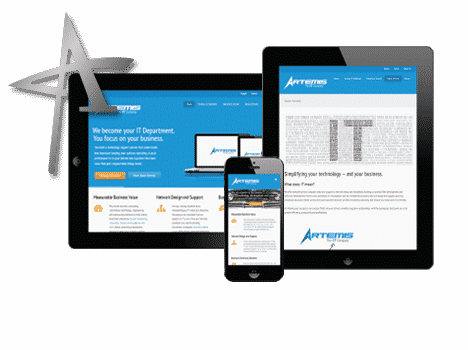 Creating responsive websites takes more work, but the payoff is great when all your website viewers get equally awesome experiences, regardless of platform.